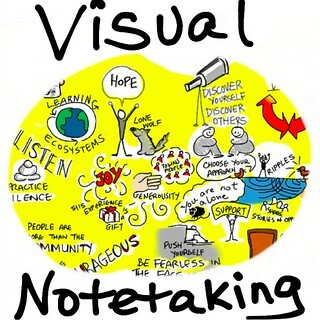 Visual notetaking is a process of representing ideas non-linguistically. (That’s a fancy of way of saying, “drawing pictures.”) Visual notetaking can include concept mapping, but also more artistic ways of visually capturing and representing ideas. On the simpler side of the visual notetaking continuum, visual notes can be used to create narrated art. On the complex end of the spectrum, some visual notetaking applications support the creation of whiteboard animation videos which include audio narration synchronized to screencasts of drawings. Visual or graphic facilitation can be used at meetings to summarize presentations and guide discussions. Whether simple or complex, visual notes can be used to more deeply process information as well as communicate it to others with images. More on visual notes / sketchnoting in this Jan 2015 post: "Narrated SketchNotes on Romans 14 & Luke 14." More resources on visual notetaking / sketchnoting are available on Mapping Media to the Curriculum.